As a food startup, you can help to change the future of our nutrition. In our opinion, this is not about a single product that you want to develop. It's about looking closely. To understand and observe the food market. To find the right investor. And with great passion to lead your startup with your team to success. The key to your success lies in the data that you want to collect, analyze and use for the successful development of a food product. There are millions of food companies around the world. Analyzing the food markets in which these companies operate can generate billions of data points. We look at the data relevant to you together with you. We generate and analyze all data relating to your financials, your brand, your product portfolio, your sales-per-shop-per-week and your team. 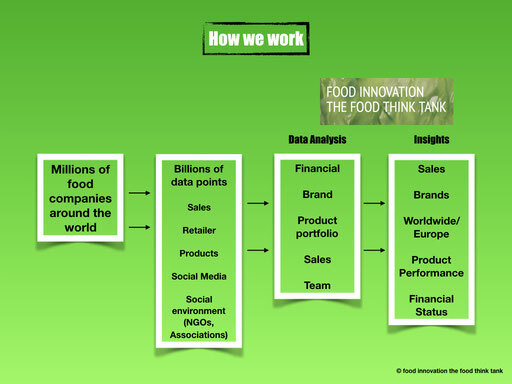 From this we create the most important insights for you and your food startup. We develop the right sales strategy for the relevant markets worldwide and analyze your product performance. We seek and impart investors. We search and arrange for fairs and events that are important for your food startup. Do you have any questions? Let's talk about the future of nutrition and what we can offer you to make your food startup successful.